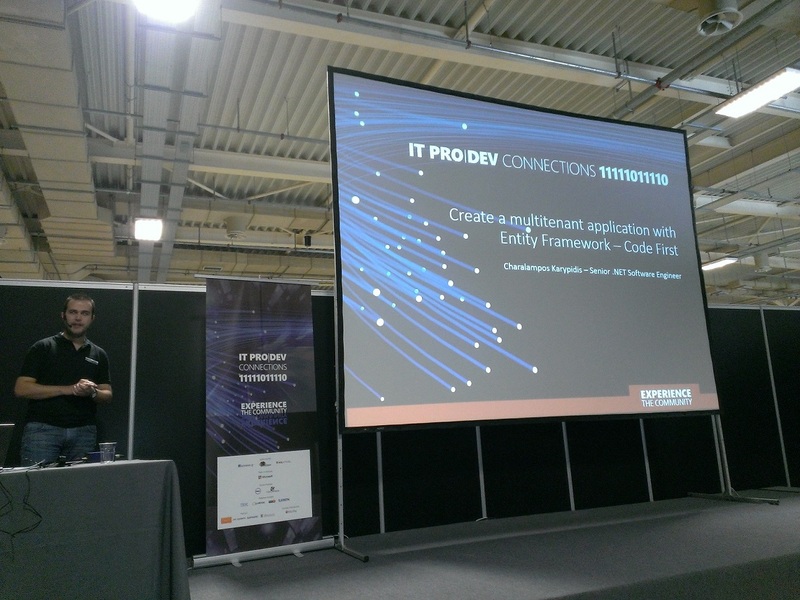 During last weekend I had the opportunity to attend ItProDevConnection for third time and second time in a row as public speaker. I have to say it was an amazing experience, I so enjoyed myself being part of a huge tech community. I met so many interesting people among else and heard about latest trends in development. 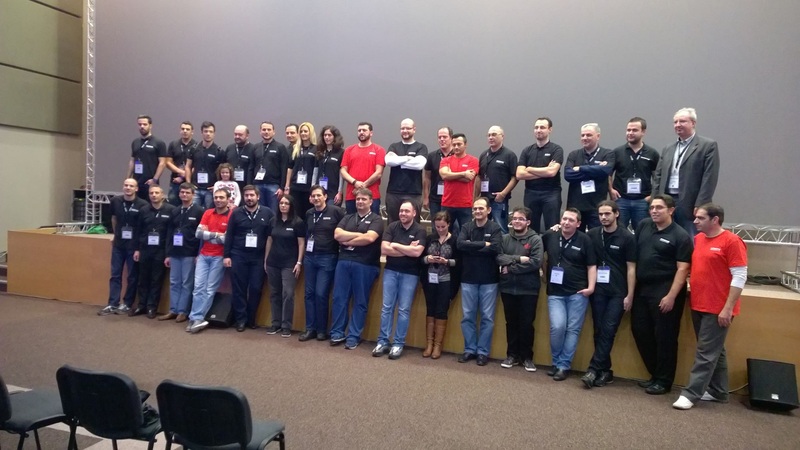 ItProDevConnection is an annual conference that is organized by dotNETZone.gr, autoexec.gr and SQLSchool.gr which are some of the biggest technical communities in Greece. The main goal of the conference is to bring together software developers and IT professionals in one event, in order to share knowledge, expertise and of course to give an opportunity to meet some really smart and interesting people. During the event there are parallel sessions regarding IT, software development and some sessions related to both fields. 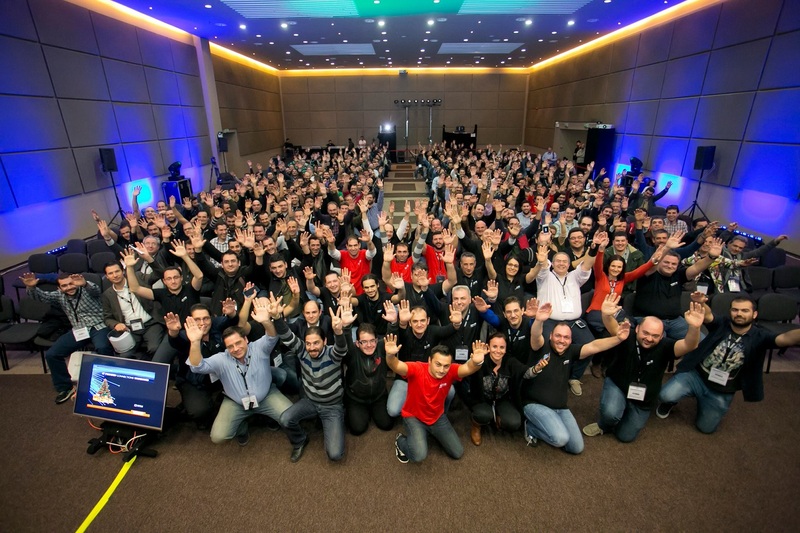 In general is a high quality conference and for sure one of the biggest happening every year in Greece. The event begun on Saturday 29th of November early in the morning by registration of the attendees and an excellent keynote from Harry Tsavdaris which is a former member of technical communities and now is responsible for the Information Systems of the Ministry of Economics. He gave us a really nice insight about the problems a huge organization faces and especially the absolute need to be on-line and available under all circumstances. 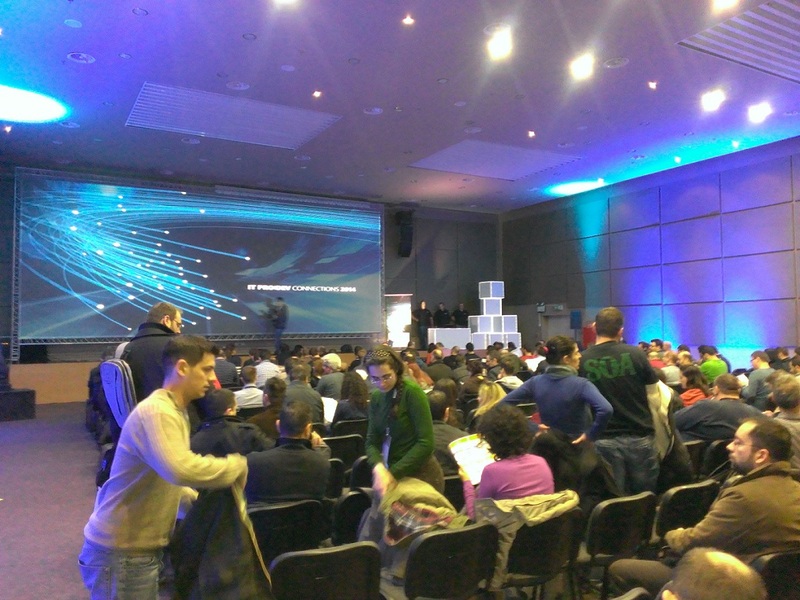 During the keynote the room was full as you can see in the following photo. This year I had the change to give a presentation for second time in a row and I was quite excited for this. 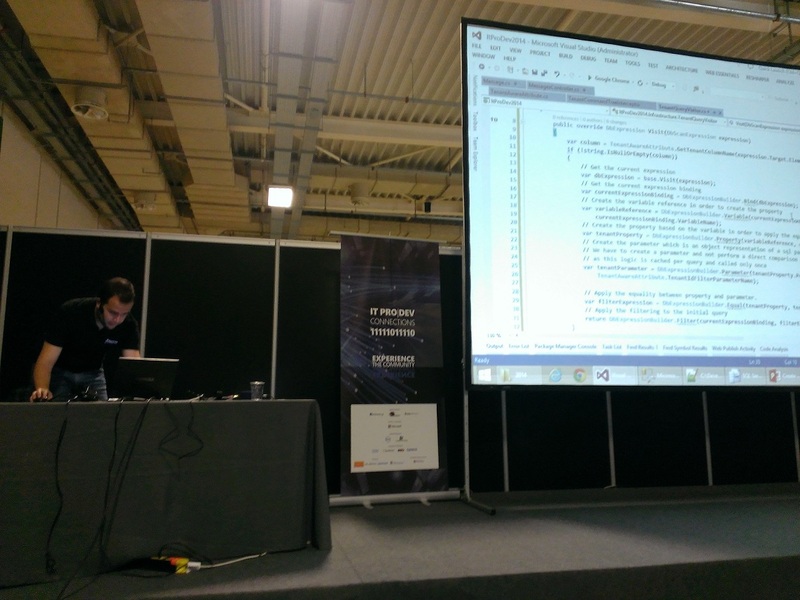 Last year I spoke about Visual Studio Online and Application Lifecycle Management by using Git. At that time the subject was really hot as Microsoft had just renamed Team Foundation Service to Visual Studio Online and the Git support was relatively new inside Visual Studio. This time I chose to change subject completely and talk about Entity Framework and how we can use some of its advance features, like interceptors, to create a multitenant application. You can find more details about the subject in the series of my blog post I wrote recently Part 1 Part 2 Part 3. It took me a fair amount of time to prepare for the session but at the end I am very satisfied with the result as a lot of people were there to attend and got some good comments at the end. On top of this I think I gave some ideas on how we can use some not well known features of the framework in order to solve some not straightforward problems. At this point I would also like to say a huge THANKS to all the people were present during my session. You can see me in action during my presentation in the two pictures below. 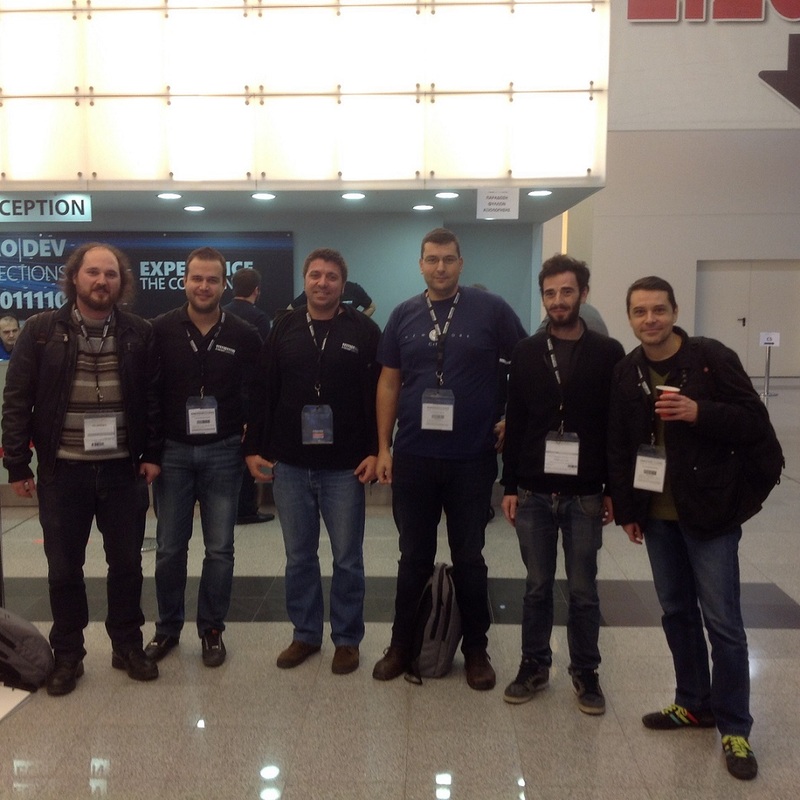 As last year I managed to meet some new really nice and smart people when not attending the technical sessions. I would like to highlight here that maybe this part of events is even more important than the technical knowledge you get there. We have the change to be among other people who share the same passion about development and technology in general. This year I was quite happy as I met many of the Thessaloniki .NET meetup fellowship and we made the decision to further proceed with our meetings in the near future. You can get a sense of who we are in the following picture. On Sunday evening, after two very exciting days and tons of useful info we had to close the event and reschedule it for the next year. During the closing session many presents were given to the attendees and we took some beautiful pictures. In the most left one there are all the attendees with the speakers and organizers and in the right one just the speakers with the awesome stuff that helped with the organization. I am really looking forward for the next event.